Swallow is the common name for various small, swift-flying passerine birds in the family Hirundinidae, characterized by long, pointed, narrow wings, a short bill, a typically notched or forked tail, and the ability to aerial feed, capturing insects on the wing. Some birds in the family have the common name of martin. While the name "martin" tends to be used for the squarer-tailed species, and the name "swallow" for the more fork-tailed species, there is no scientific distinction between these two groups. A few other species in Hirundinidae, comprising the genus Psalidoprocne, have the common name of saw-wing. In Europe, the name swallow is used colloquially as a synonym for the barn swallow. The family contains around 83 species in 19 genera. In this article, unless specified, the term swallows will be used in a collective sense for all members of the family, including species commonly known as martins or saw-wings. The swallows have a cosmopolitan distribution across the world and breed on all the continents except Antarctica. They also occur on a number of oceanic islands. A number of species are long-distance migrants. With their agility in flight, ability to produce many different calls or songs, and some species nesting in and around human settlements and buildings, swallows have long fascinated people. They even have been incorporated into religious stories, partly due to their arrival in Europe around the time of Easter and because of apocryphal stories placing them at Jesus's crucifixion. Ecologically, they provide a valued role in controlling the numbers of insect species. A few species of swallows are threatened with extinction by human activities, although other species have benefited from human changes to the environment. As passerine birds, or perching birds, swallows have feet that are specialized for holding onto a branch, with three toes directed forward without any webbing or joining, and one toe directed backward. Swallows belong to the suborder Passeri (oscines) with such birds as warblers, finches, wrens, starlings, cowbirds, lyrebirds, blackbirds, jays, and larks. It is believed the Hirundinidae family originated in Africa as hole-nesters; Africa still has the greatest diversity of species (1989). The Hirundinidae family typically comprises two subfamilies: Pseudochelidoninae (the river martins of the genus Pseudochelidon) and Hirundininae (all other swallows and martins, including saw-wings). Of the 19 genera, the following contain species that utilize the common name swallow: Pseudhirundo, Cheramoeca, Phedina, Tachycineta, Notiochelidon, Haplochelidon, Atticora, Neochelidon, Stelgidopteryx, Alopochelidon, Hirundo, Cecropis, and Petrochelidon. The following genera contain species that utilize the common name martin: Pseudochelidon, Phedina, Riparia, Progne, Ptyonoprogne, Delichon, and Petrochelidon. 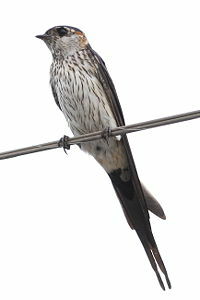 (Petrochelidon has some species with the common name martin and some known as swallows.) The saw-wings comprise the genus Psalidoprocne. The common name of this later group is derived from the rough outer edge of the outer primary feather on the wing, which is rough due to recurved barbs. The swallows and martins (and saw-wings) have an evolutionary conservative body shape that is similar across the family but is unlike that of other passerines (Turner 2004). Swallows have adapted to hunting insects on the wing by developing a slender streamlined body, and long pointed wings, which allow great maneuverability and endurance, as well as frequent periods of gliding. Their body shape allows for very efficient flight, which costs 50-75 percent less for swallows than equivalent passerines of the same size. Swallows usually forage at around 30 to 40 kilometers per hour although they are capable of reaching speeds of between 50 to 65 kilometers per hour when traveling. Like the unrelated swifts and nightjars, which hunt in a similar way, swallows have short bills, but strong jaws and a wide gape. Their body length ranges from about 10 to 24 centimeters (3.9–9.4 inches) and their weight from about 10 to 60 grams (0.4–2.1 ounces). The wings are long, pointed, and have nine primary feathers. The tail has 12 feathers and may be deeply forked, somewhat indented, or square-ended. A long tail increases maneuverability, and may also function as a sexual adornment, since the tail is frequently longer in males. Female barn swallows will select mates on the basis of tail length. The legs are short, and their feet are adapted for perching rather than walking, as the front toes are partially joined at the base. Swallows are capable of walking and even running, but they do so with a shuffling, waddling gait. The leg muscles of the river martins (Pseudochelidon) are stronger and more robust than those of other swallows (Turner 2004). The most common hirundine plumage is glossy dark blue or green above and plain or streaked underparts, often white or rufous. Species which burrow or live in dry or mountainous areas are often matte brown above (e.g., sand martin and crag martin). The sexes show limited sexual dimorphism or none, with longer outer tail feathers in the adult male probably being the commonest distinction where one exists. The swallows have a worldwide cosmopolitan distribution, occurring on every continent except Antarctica. One species, the Pacific swallow, occurs as a breeding bird on a number of oceanic islands in the Pacific Ocean, and a number of migratory species are common vagrants to other isolated islands and even to some sub-Antarctic islands. Many species have enormous worldwide ranges, particularly the barn swallow, which breeds over most of the northern hemisphere and winters over most of the southern hemisphere. The family uses a wide range of habitats. They are dependent on flying insects, and as these are common over waterways and lakes, they will frequently feed over these, but they can be found in any open habitat including grasslands, open woodland, savanna, marshes, mangroves and scrubland, from sea level to high alpine areas (Turner 2004). Many species inhabit human-altered landscapes including agricultural land and even urban areas. Land use changes have also caused some species to expand their range, most impressively the welcome swallow which began to colonize New Zealand in the 1920s, started breeding there in the 1950s, and is now a common land bird there (Tarburton 1993). Species breeding in temperate regions migrate during the winter when their insect prey populations collapse. Species breeding in more tropical areas are often more sedentary, although several tropical species are partial migrants or make shorter migrations. In antiquity, it was thought that swallows hibernated in a state of torpor, even that they withdrew for the winter under water. Aristotle ascribed hibernation not only to swallows, but also to storks and [kite]]s. Hibernation of swallows was considered a possibility even by as acute an observer as Rev. Gilbert White, in his The Natural History and Antiquities of Selborne (1789, based on decades of observations). This idea may have been supported by the habit of some species to roost in some numbers in dovecotes, nests, and other forms of shelter during harsh weather, even apparently entering torpor (Turner 2004). Swallows are excellent fliers, and use these skills to attract a mate and to feed. 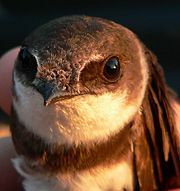 Some species, like the mangrove swallow, are territorial, whereas others are not and simply defend their nesting site. In general, the males select a nest site, and then attract a female using song and flight, and (dependent on the species) guard their territory. The size of the territory varies depending on the species of swallow; in colonial-nesting species, it tends to be small, but it may be much larger for solitary nesters. Outside of the breeding season, some species may form large flocks, and species may also roost communally. This is thought to provide protection from predators such as sparrowhawks and hobbies (Turner 2004). These roosts can be enormous; one winter roosting site of barn swallows in Nigeria attracted 1.5 million individuals (Bijlsma and van den Brink 2003). Non-social species do not form flocks but recently fledged chicks may remain with their parents for a while after the breeding season. For the most part, swallows are insectivorous, taking flying insects on the wing (Turner 2004). Across the whole family, a wide range of insects are taken from most insect groups, but the composition of any one prey type in the diet varies by species and with the time of year. Individual species are selective, they do not scoop up every insect around them, but instead select larger prey items than would be expected by random sampling. They also avoid certain prey types; in particular stinging insects such as bees and wasps are generally avoided. In addition to insect prey, a number of species will occasionally consume fruits and other plant matter. Species in Africa have been recorded eating the seeds of Acacia trees, and these are even fed to the young of the greater striped swallow (Underhill and Hofmeyr 2007; Turner 2004). Swallows generally forage for prey that is on the wing, but they will on occasion snap prey off branches or on the ground. In aerial feeding, the flight may be fast and involve a rapid succession of turns and banks when actively chasing fast moving prey. Less agile prey may be caught with a slower more leisurely flight that includes flying in circles and bursts of flapping mixed with gliding. Where several species of swallow feed together, they will be separated into different niches based on height off the ground, some species feeding closer to the ground whereas other feeding at higher levels. Similar separation occurs where feeding overlaps with swifts. Niche separation may also occur with the size of prey chosen. Some species nest in existing cavities, for example in an old woodpecker nest, while other species excavate burrows in soft substrate such as sand banks (Turner 2004). Swallows in the genera Hirundo, Ptyonoproggne, Cecropis, Petrochelidon, and Delichon build mud nests close to overhead shelter in locations that are protected from both the weather and predators. The mud-nesters are most common in the Old World, particularly Africa, whereas cavity-nesters are the rule in the New World. Mud nesting species in particular are limited in areas of high humidity, which causes the mud nests to crumble. Mud nests are constructed by both males and females, and among the tunnel diggers the excavation duties are shared as well. In historical times, the introduction of man-made stone structures such as barns and bridges, together with forest clearance, has led to an abundance of colony sites around the globe, significantly increasing the breeding ranges of some species. Many cave, bank, and cliff dwelling species of swallow nest in large colonies. Birds living in large colonies typically have to contend with both ectoparasites and conspecific nest parasitism (Brown and Brown 1986; Brown 1984). Old males benefit most from coloniality, since they are able to maintain their own nests and benefit from frequent extra-pair copulations. Pairs of mated swallows are monogamous (Winkler) and pairs of non-migratory species often stay near their breeding area all year, though the nest site is defended most vigorously during the breeding season. Migratory species often return to the same breeding area each year, and may select the same nest site if they were previously successful in that location. First-year breeders generally select a nesting site close to where they were born and raised (Davis and Freedman 2004). The breeding of temperate species is seasonal, whereas that of subtropical or tropical species can either be continuous throughout the year or seasonal. Seasonal species in the subtropics or tropics are usually timed to coincide with the peaks in insect activity, which is usually the wet season, but some species like the white-throated blue swallow nest in the dry season to avoid flooding in their riverbank nesting habitat (Turner 2004). All swallows will defend their nests from egg predators, although solitary species are more aggressive towards predators than colonial species (Snapp 1976). The eggs of swallows tend to be white, although those of some mud-nesters are speckled. The average clutch size is around four to five eggs in temperate areas and two to three eggs in the tropics. Incubation stints last for 5 to 15 minutes and are followed by bursts of feeding activity. From laying, swallow eggs take between 10 to 21 days to hatch, with 14 to 18 days being more typical. The incubation duties are shared between females and males in some species; in others the eggs are incubated solely by the females. Among the species where the male helps with incubation, the contribution varies among species, with some species like the cliff swallow sharing the duties equally and the female doing most of the work in others. Among the barn swallows, the male of the American subspecies helps (to a small extent) whereas the European subspecies does not. Even in species where the male does not incubate the eggs, the male may sit on them when the female is away to reduce heat loss. Overall, the contribution towards parental care of male swallows is the highest of any passerine bird (Turner 2004). Regardless of whether the species has males that incubate or brood the chicks, the males of all swallows and martins will help feed the chicks. The chicks of swallows hatch naked, generally with only a few tufts of down. The eyes are closed when born and do not fully open for up to 10 days. The feathers take a few days to begin to sprout, and the chicks are brooded by the parents until they are able to thermoregulate. On the whole, they develop slowly compared to other passerine birds. The parents do not usually feed the chicks individual insects but instead a bolus of food comprised of ten to a hundred insects. It is difficult to judge when swallows and martins fledge, as they will be enticed out of the nest after three weeks by parents but frequently return to the nest afterward in order to roost. Swallows are able to produce many different calls or songs, which are used to express excitement, to communicate with others of the same species, during courtship, or as an alarm when a predator is in the area. The songs of males are related to the body condition of the bird and are presumably used by females to judge the physical condition and suitability for mating of males (Saino et al. 1997). Begging calls are used by the young when soliciting food from their parents. The typical song of swallows is a simple, sometimes musical twittering. Because of the readiness with which some species nest in and around human settlements and buildings, people have had a long experience with swallows and many myths and legends have arisen as a consequence (Turner 2004). The migratory habits of the European species have led to an association with spring, as recorded in the proverb "one swallow does not make a summer." They have also been incorporated into religious stories, in part because of their arrival in Europe around the time of Easter, and apocryphal stories place them at the crucifixion of Jesus, either trying to distract those sent to arrest Jesus in the garden or to comfort Jesus on the cross. They are also mentioned in the Koran attacking Christians who were attacking Mecca. Older legends have it that Athene turned into one in order to flee danger. 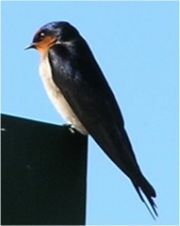 Species of swallow and martin that are threatened with extinction are generally endangered due to habitat loss. This is presumed to be the reason behind the decline of the critically endangered white-eyed river martin, a species that is only known from a few specimens collected in Thailand. The species presumably breeds in riverbanks, a much diminished habitat in SE Asia. 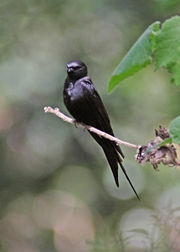 Two insular species, the Bahama swallow and golden swallow, have declined due to forest loss and also competition with introduced species such as starlings and sparrows, which compete with these swallows for nesting sites. Bijlsma, R., and B. van den Brink. 2003. A barn swallow Hirundo rustica roost under attack: Timing and risks in the presence of African hobbies Falco cuvieri. Ardea 93(1): 37-48. Retrieved November 18, 2008. Brown, C., and M. Brown. 1986. Ectoparasitism as a cost of coloniality in cliff swallows (Hirundo pyrrhonota). Ecology 67(5): 1206-1218. Brown, C. 1984. Laying eggs in a neighbor's nest: Benefit and cost of colonial nesting in swallows. Science 224(4648): 518-519. Davis, G. J., and B. Freedman. 2004. Swallows. In B. Grzimek, D. G. Kleiman, V. Geist, and M. C. McDade, Grzimek's Animal Life Encyclopedia. Detroit: Thomson-Gale. ISBN 0787657883. Saino, N., P. Galeotti, R. Sacchi, and A. Møller. 1997. Song and immunological condition in male barn swallows (Hirundo rustica). Behavioral Ecology 8: 364-371. Snapp, B. 1976. Colonial breeding in the barn swallow (Hirundo rustica) and its adaptive significance. The Condor 78(4): 471-480. Retrieved November 18, 2008. Tarburton, M. K. 1993. A comparison of the breeding biology of the welcome swallow in Australia and recently colonized New Zealand. Emu 93(1): 34-43. Turner, A., and C. Rose. 1989. Swallows and martins: An identification guide and handbook. Houghton-Mifflin. ISBN 0395511747. Turner, A. 2004. Family Hirundinidae (swallows and martins). In J. del Hoyo Calduch, A. Elliott, and J. Sargatal, eds., Handbook of the Birds of the World. Volume 9. Cotingas to Pipits and Wagtails. Barcelona: Lynx Edicions. ISBN 8487334695. Underhill, L., and J. Hofmeyr. 2007. Barn swallows Hirundo rustica disperse seeds of rooikrans Acacia cyclops, an invasive alien plant in the Fynbos Biome. Ibis 149(3): 468-471. Retrieved November 18, 2008. Winkler, D. W. n.d. Swallows and martins. Department of Ecology and Evolutionary Biology, Cornell University. Retrieved November 18, 2008. This page was last modified on 24 November 2008, at 21:49.